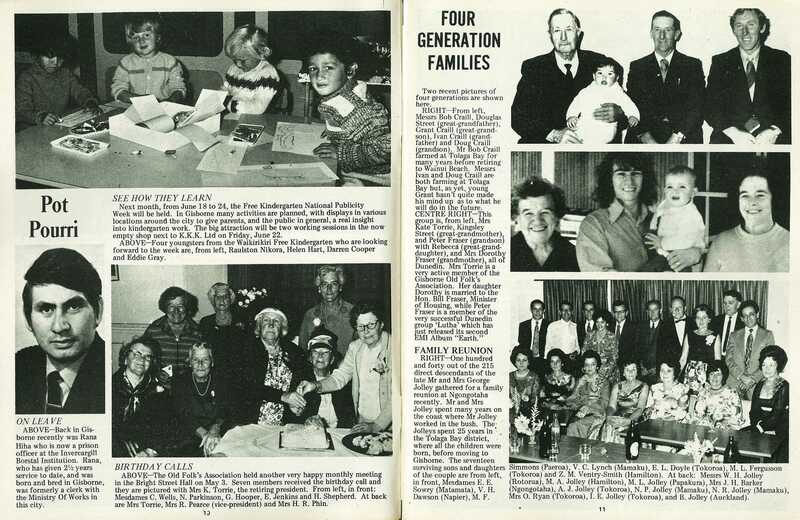 Two recent pictures of four generations are shown here. 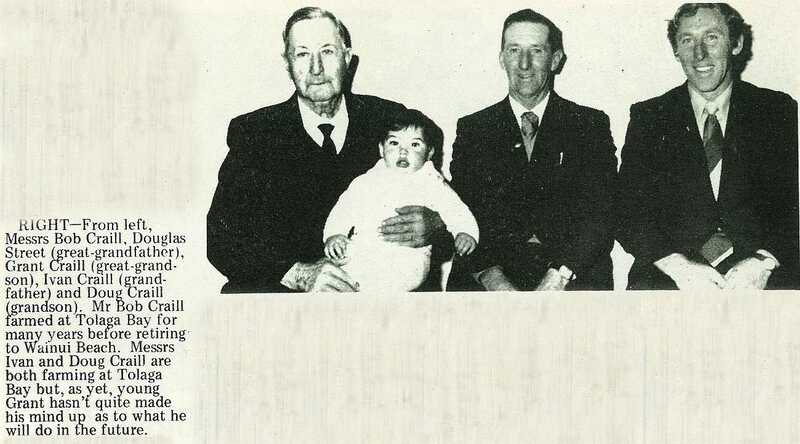 From left, Messrs Bob Craill, Douglas Street (great-grandfather), Grant Craill (great-grandson), Ivan Craill (grandfather) and Doug Craill (grandson). Mr Bob Craill farmed at Tolaga Bay for many years before retiring to Wainui Beach. Messrs Ivan and Doug Craill are both farming at Tolaga Bay but, as yet, young Grant hasn't quite made his mind up as to what he will do in the future. 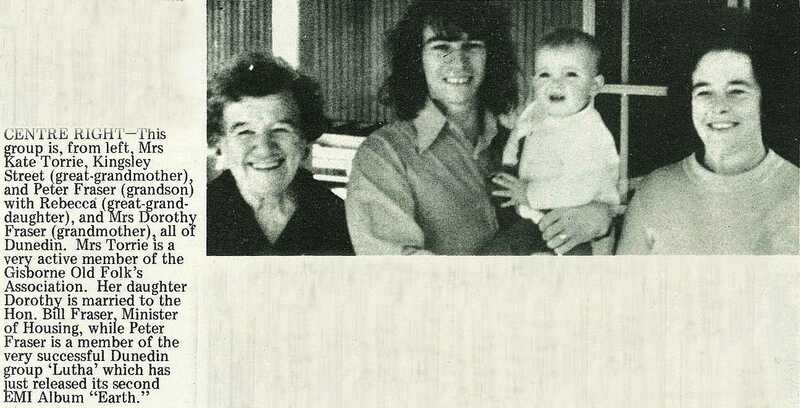 This group is, from left Mrs Kate Torrie, Kingsley Street (great-grandmother), and Peter Fraser (grandson) with Rebecca (great-granddaughter), and Mrs Dorothy Fraser (grandmother), all of Dunedin. Mrs Torrie is a very active member of the Gisborne Old Folk's Association. Her daughter Dorothy is married to the Hon. Bill Fraser, Minister of Housing, while Peter Fraser is a member of the very successful Dunedin group 'Lutha' which has just released its second EMI Album "Earth." One hundred and forty out of the 215 direct descendants of the late Mr and Mrs George Jolley gathered for a family reunion at Ngongotaha recently. Mr and Mrs Jolley spent many years on the coast where Mr Jolley worked in the bush. 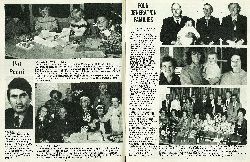 The Jolleys spent 25 years in the Tolaga Bay district, where all the children were born, before moving to Gisborne. 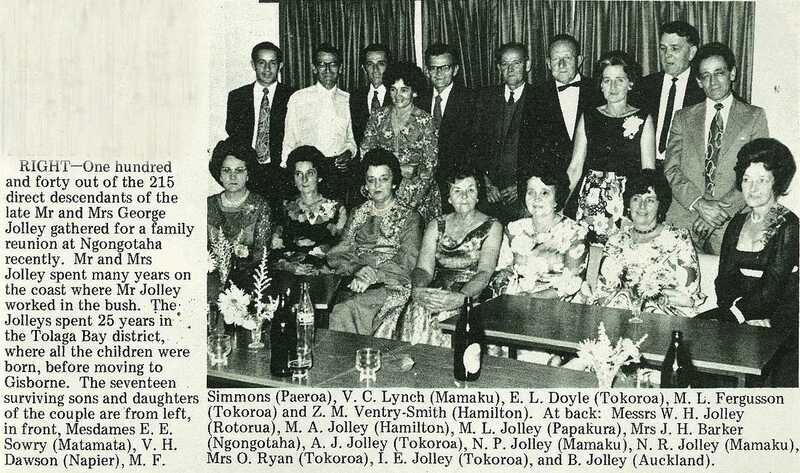 The seventeen surviving sons and daughters of the couple are from left, in front, Mesdames E. E. Sowry (Matamata), V. H. Dawson (Napier), M. F. Simmons (Paeroa), V. C. Lynch (Mamaku), E. L. Doyle (Tokoroa), M. L. Fergusson (Tokoroa) and Z. M. Ventry-Smith (Hamilton). At back: Messrs W. H. Jolley (Rotorua), M. A. Jolley (Hamilton), M. L. Jolley (Papakura), Mrs J. H. Barker (Ngongotaha), A. J. Jolley (Tokoroa), N. P. Jolley (Mamaku), N. R. Jolley (Mamaku), Mrs O. Ryan (Tokoroa), I. E. Jolley (Tokoroa), and B. Jolley (Auckland).